As usual work and family have been taking my time away from my build, but all is well and moving ahead. In the time I had, I finished up the tillers and working on the Mast. 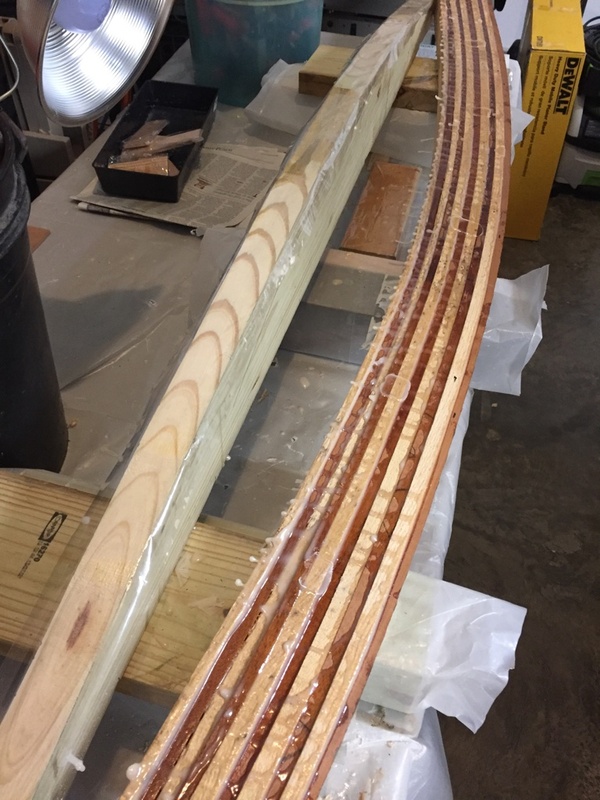 I did finish up both Tillers so that they would fit in the rudder. Since I made them slightly thicker than 3/4 inches, I needed to narrow it down in the part that fits into the tiller. I just marked the ends on both and used a belt sander. That did a quick job of the task. I need to figure out how to keep the tiller from coming out of the rudder. 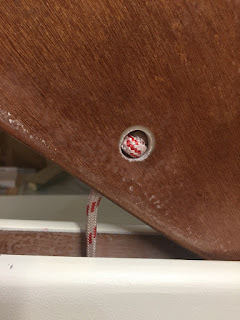 I have seen some pictures of builders using a pin of some type, but there doesn't look like a lot of extra room to drill a hole. 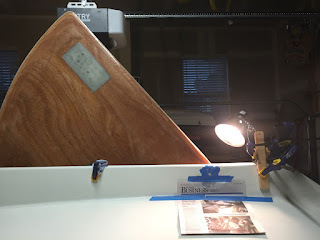 Below is a couple pictures of the tiller in the rudder. You can see there is not much wood coming out. Now for the mast. 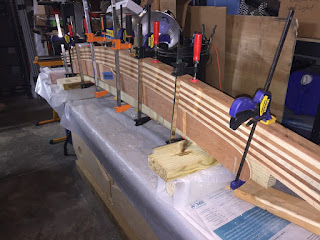 I had previously glued up 2 of the 16 ft pieces for the mast and finished gluing up the other 2, so I have all 4 pieces. 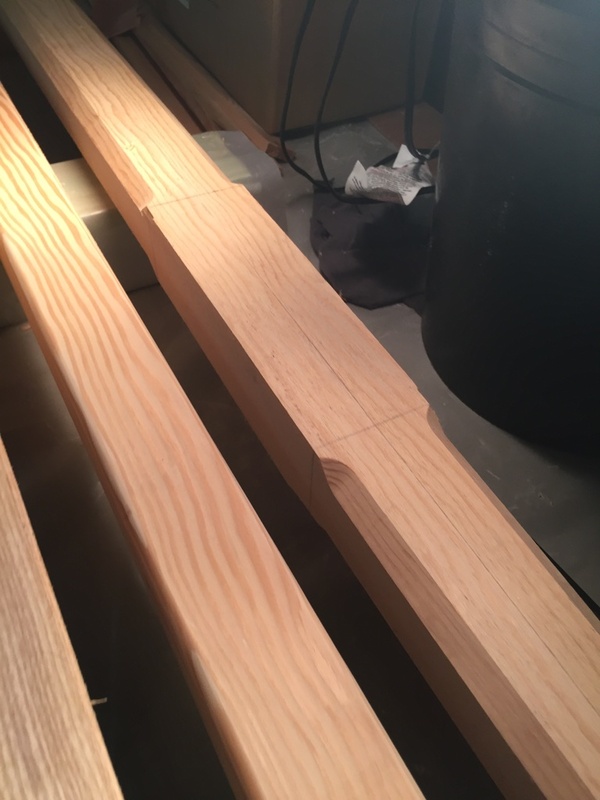 Once these were cured for a few days, I used a hand plane and sander to finish up the joint, so it looked good. 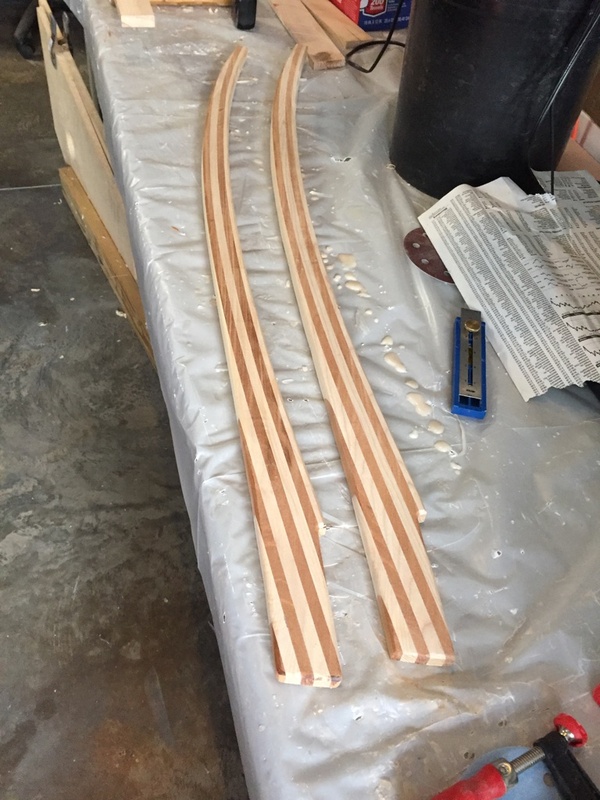 Now the next part was how I was going to cut these 4 - 16 foot long pieces. 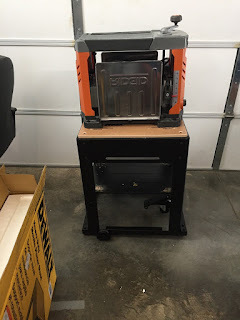 I purchased a Festool Skill Saw TS 55 Req Track saw for the job and other jobs I plan on doing. After spending a long time marking out the 4 pieces from the plans and double checking things a few times I put saw to wood! I setup outside with my tent, since it has started to get warm. 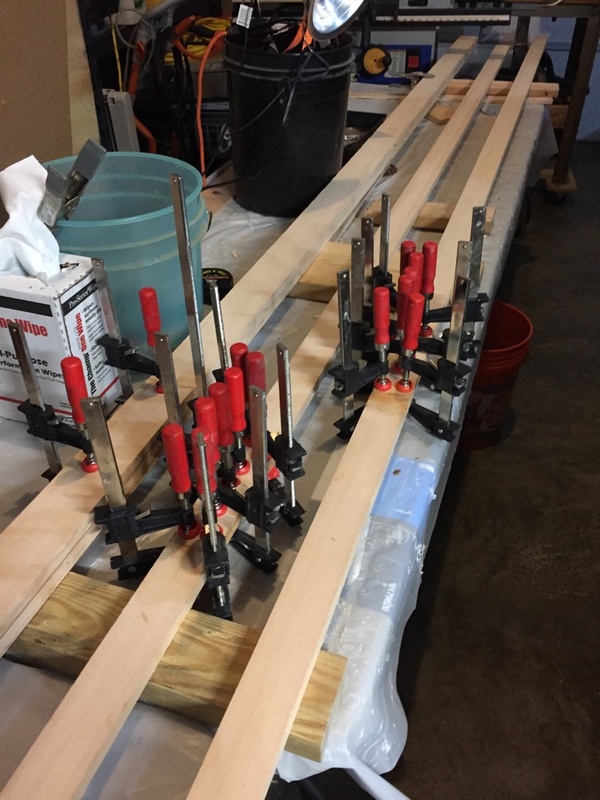 The track is too wide to sit properly on a small piece of 3" wood, so I just used multiple pieces to give me a good work surface. I lined the track up to my markings and cut away. I think this worked out very well. Moving the track to the next section was no problem and you could barely tell where I started/stopped cutting. Now for the rabbet that needs to be cut on the 2 side staves. I followed the manual and used my table saw. Unless you have a long in/out feed table, you are going to need some help cutting the 16 ft. pieces. Luckily my son was home and he help me out. 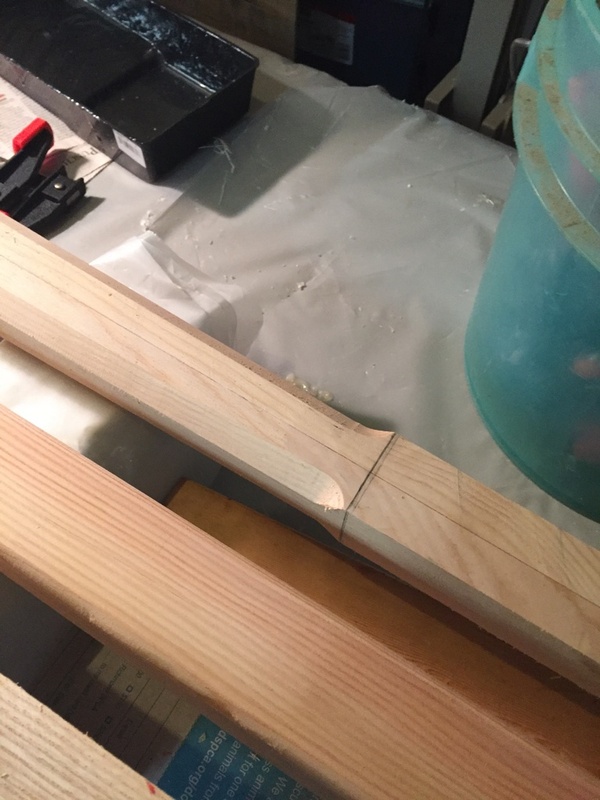 Being on the cautious side, I set the saw a little bit too short for the width of the side staves. 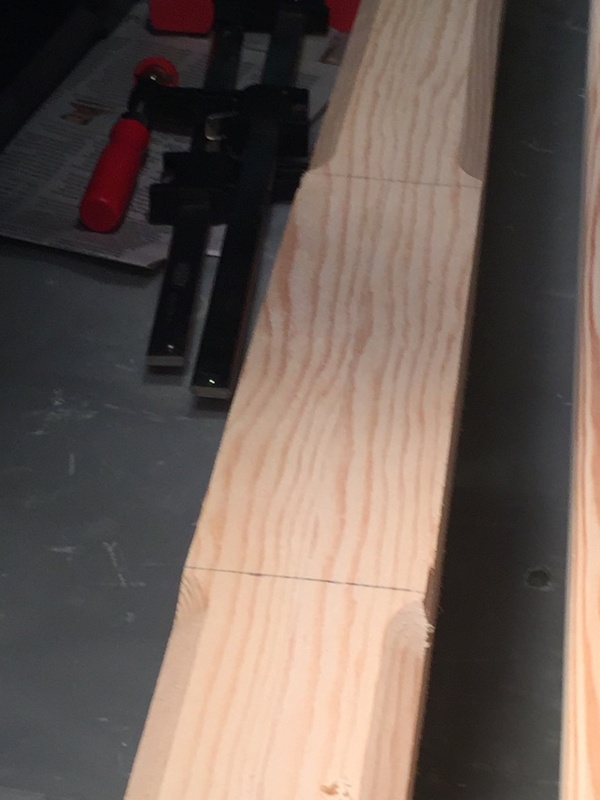 Since it was getting late and I was cleaning up, I just decided to cut the 1/16 inch portion off with my router at later time. I set that up yesterday and made the final cut. Now they fit flush as they should. 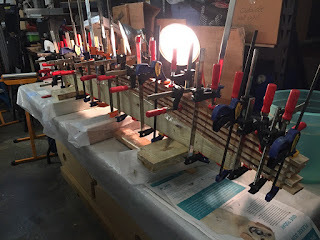 Below are a couple shots of the Mast dry clamped together. Thats where I realized that they pieces were not fitting together properly. 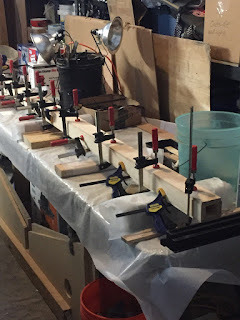 I did the router trick yesterday and then cleaned up things with a hand plane. I will go over things again before I glue up. I will probably see if my son can assist with the gluing up as well. 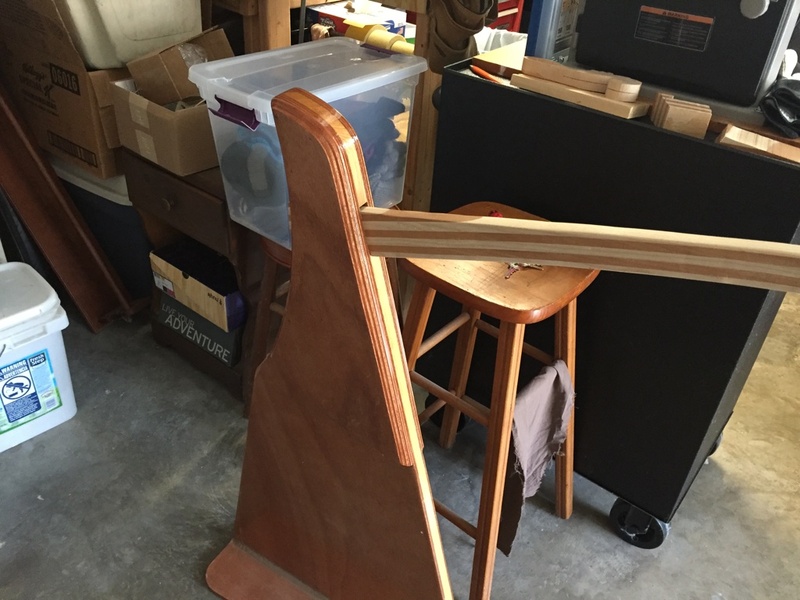 Sort of awkward trying to get the 4 pieces together and glue up with just one person. 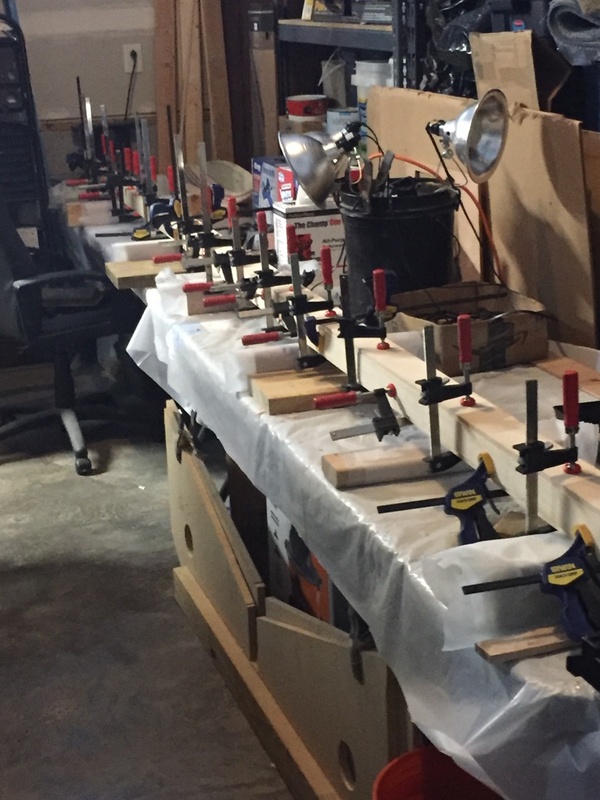 I also realized that I didn't have enough clamps. I picked up some yesterday at the Home Depot. I also need to finish up the top of the mast piece that fits inside the mast. Or to be clearer. I need to start that project! 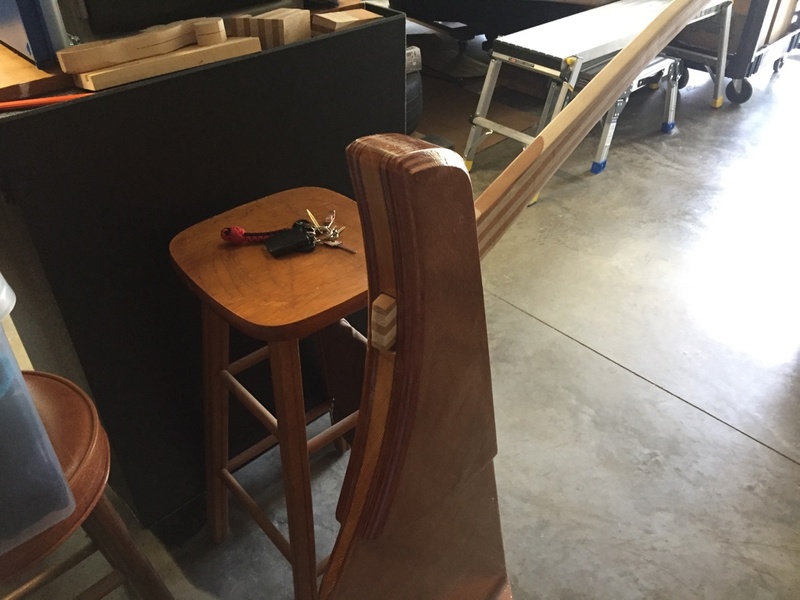 The bottom piece of wood doesn't require any adjustment. Next post should have a completed mast! But in the time being, headed out of town again! Got to keep the admiral happy! Still slowing moving ahead. Work and going out of town don't help, but I will get there! 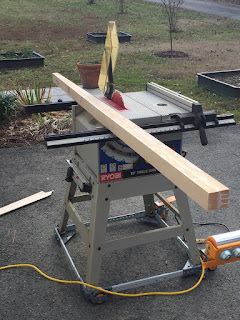 After the boom gallows, I used some of the same wood I cut for the tiller. 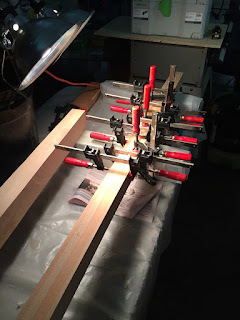 I glued up things using a new jig I made. 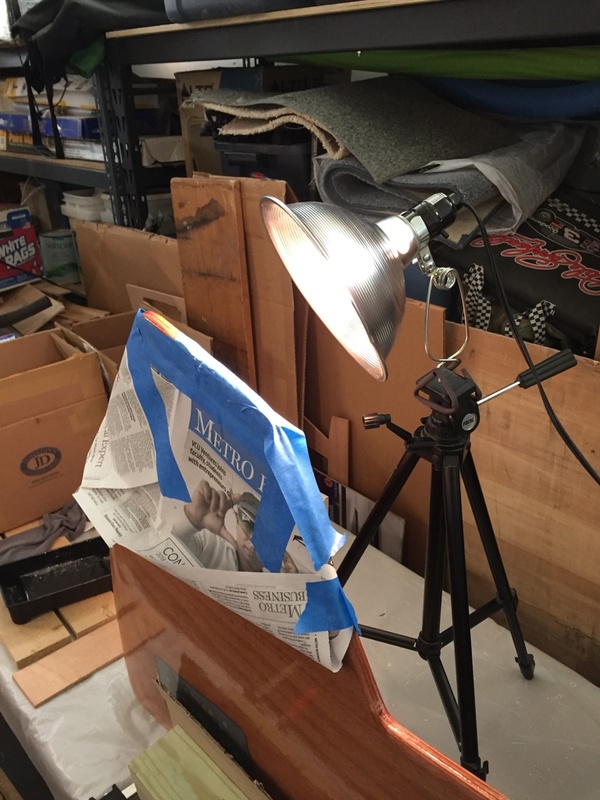 Since it was very cold in the garage, I had to use the work lights to help the epoxy cure. I left them on for about 24 plus hours and then clamped up for about a week before removing from the gig. After removing from the jig, you can see all the epoxy I had to clean up. I definitely made sure I had enough epoxy and coated both sides of each piece. 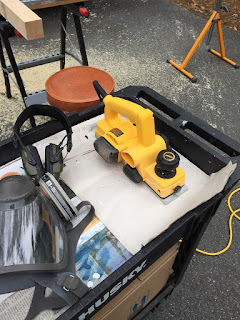 In the picture below you can see the electric hand planer I used to clean things up and get a flat surface. After I cleaned things up I had a nice piece of stock to cut out the tiller using the pattern. Since the wood I used was for the boom gallows, it was 2 inches wide. I figured I could cut down the middle and make 2 tillers. One to be used as a spare. 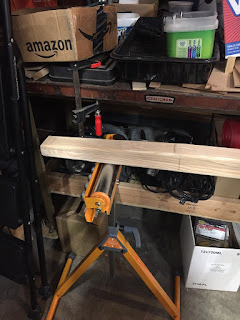 Cutting the the tiller on a vertical cut on the bandsaw was somewhat challenging, but I made it through. I really need to get a replace bandsaw blade. It seemed very dull. So after cutting them out, I used a hand plane to clean things up. I then took my router with a 1/4 bit and did all the edges. Also did a little rough sanding. Below are the pictures. The thickness of the tiller is supposed to be 3/4 inches. Mine is a little under 1" in thickness. 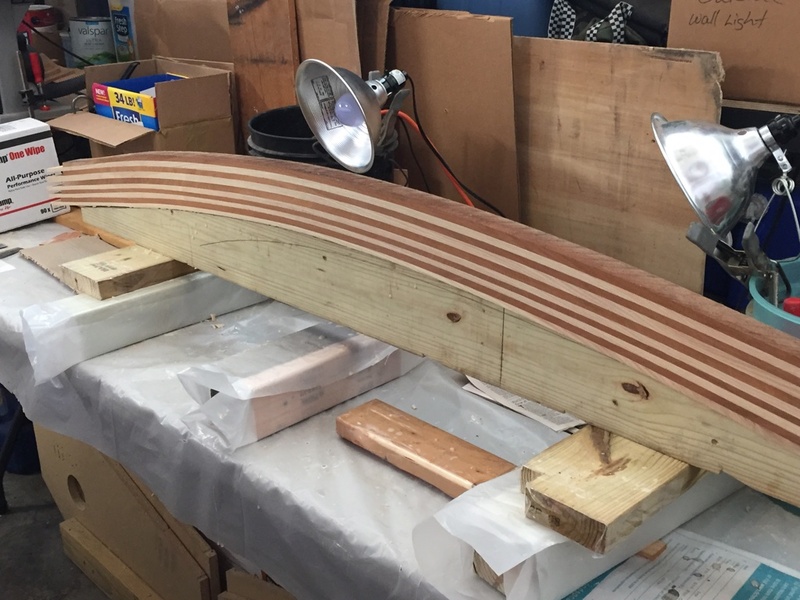 It seems comfortable in my hand, but I need to narrow the end down where it fits into the rudder. I will work on that this weekend. I think the final product will look nice and I have a spare!! 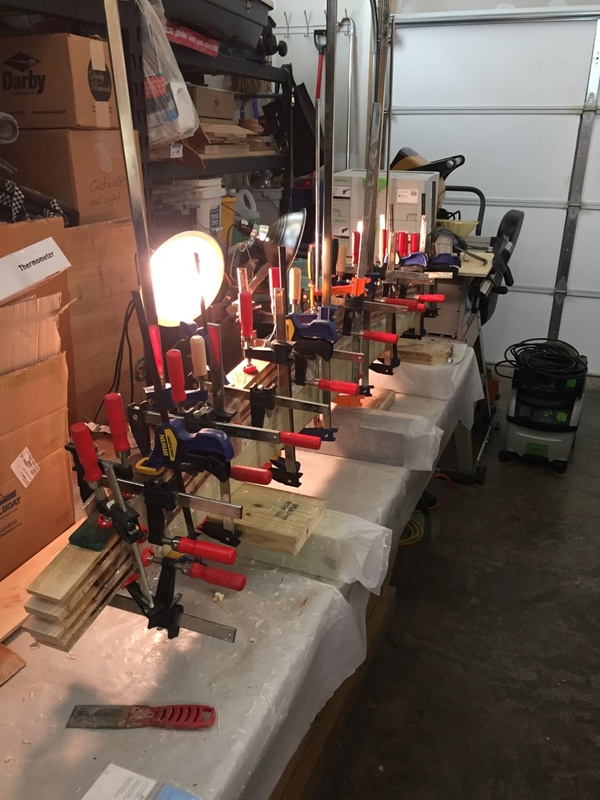 I have had a hard time and I think I have stated it before that I have trouble using hand planes. 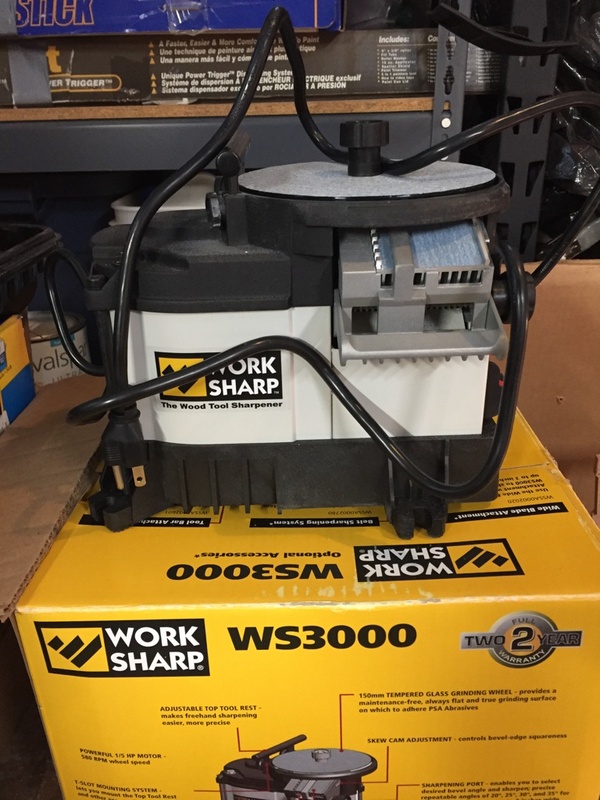 Well I finally bought a Work Sharp 3000 to sharpen them. It is like night and day how good they work now. I have tried to sharpen by hand, but never did a good job. Thy work great now that they are actually sharp!!! Below is where I was working on the scarf joints on the pieces for the mast. I will be working on that this weekend as well as some other projects. I finished up the boom gallow over these past couple weeks. 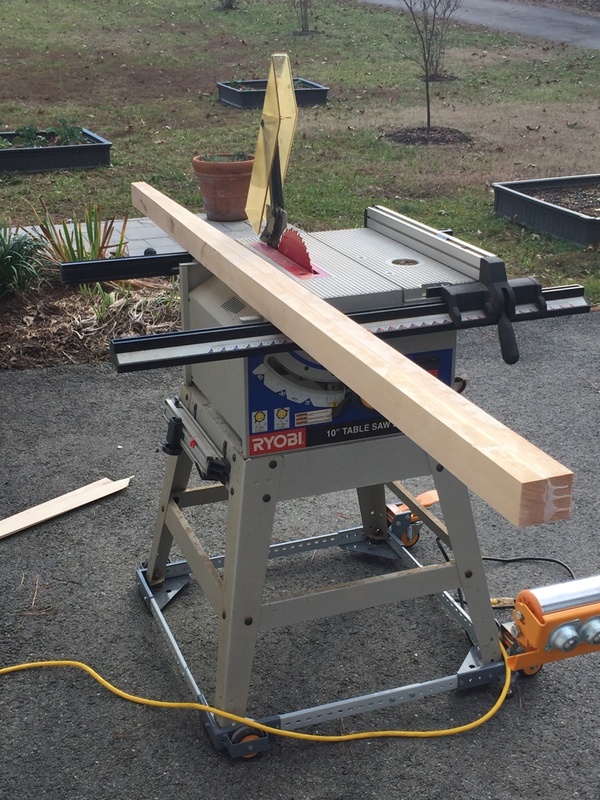 I forgot to take pictures of the Rigid Planer in action, but I moved everything outside as to not make a mess inside. 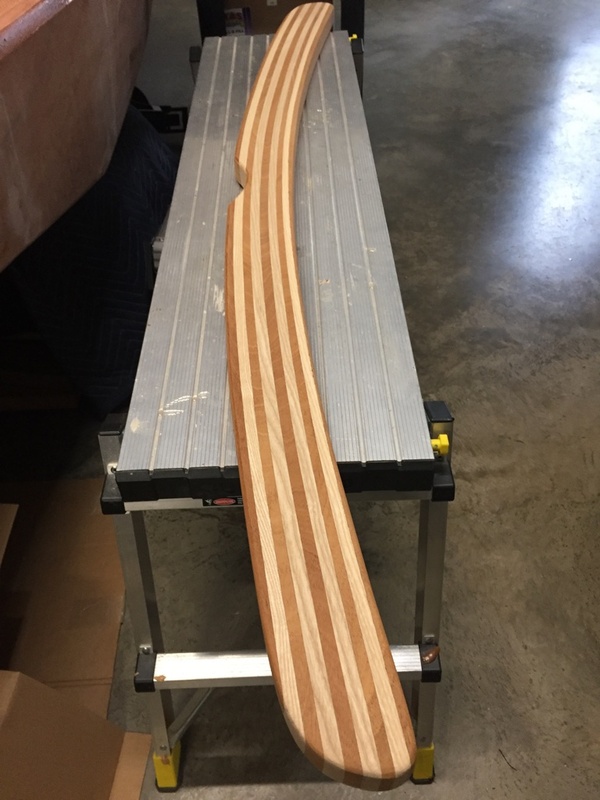 This was the first time I used my thickness planer. It worked pretty well. Took a little time to get used to and was making a strange noise. Still not sure what that is?? I took the boom gallow down to 1 1/2 inches per the instructions and then used the bandsaw to cut out the final shape. 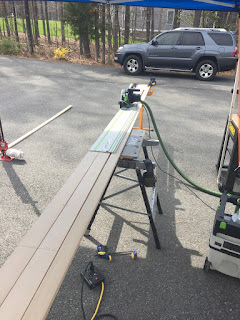 This past weekend I used my Orbital Festool sander to sand down using 80 and then 120. 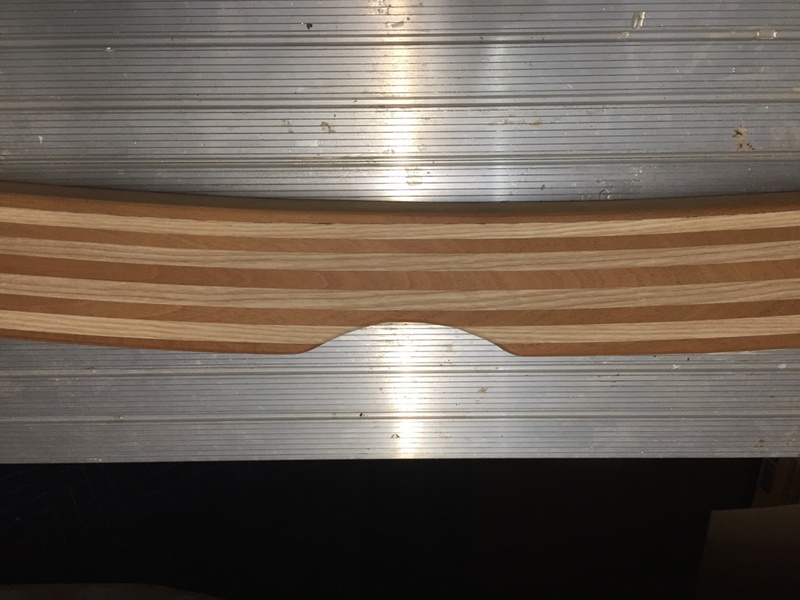 I then took it outside and used my router to do a 1/4" round-over on all the edges. I was very pleased with the way it turned out. Next up on this will be to apply 2 coats of epoxy and then varnish. Will need to wait till warmer weather for this. 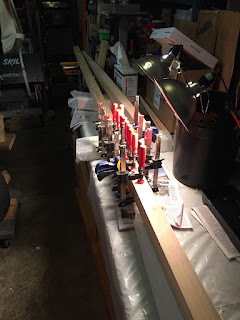 While I had the thickness planer outside, I marked all the mast pieces "staves" I need to build the mast. I marked the scarf joint on all the 8 pieces and used my hand planer to get down to the pencil lines. I will use a hand plane to get the rest. I need to sharpen my hand planes and just purchased "Wood Sharp 3000" for this purpose. I will let you know how that turns out. Below is some of the mess I made in the driveway. I like the clean-up using a leaf blower!!! :-) Just blow it in the woods! Next up will be cleaning up the scarf joints and working on the tiller. 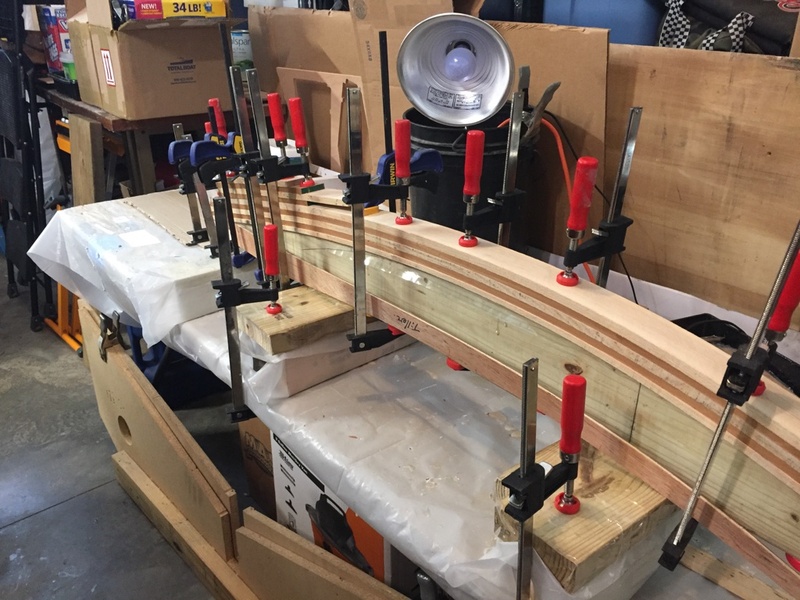 I have all the wood strips cut and made a new jig out of some pressure treated wood. I just used the pattern for the tiller and marked one edge on the pressure treated wood and then cut out with jigsaw. This gives me the shape to clamp down on when epoxying them together. Below is the clamping jig. I used the same piece of wood as the boom gallow and you can see the 2 pieces screwed to the jig to hold it to the table. Also on one side of the tiller where it fits into the rudder, I had to add a couple of short pieces to get the thickness. With the tiller only being 3/4 inches, I am hoping I can get 2 tillers out of it. Maybe 1 to use as a spare. The two types of wood I am using are Ash and Mahogany. The pieces are just dry fitted. Boom Gallow and Planer work! 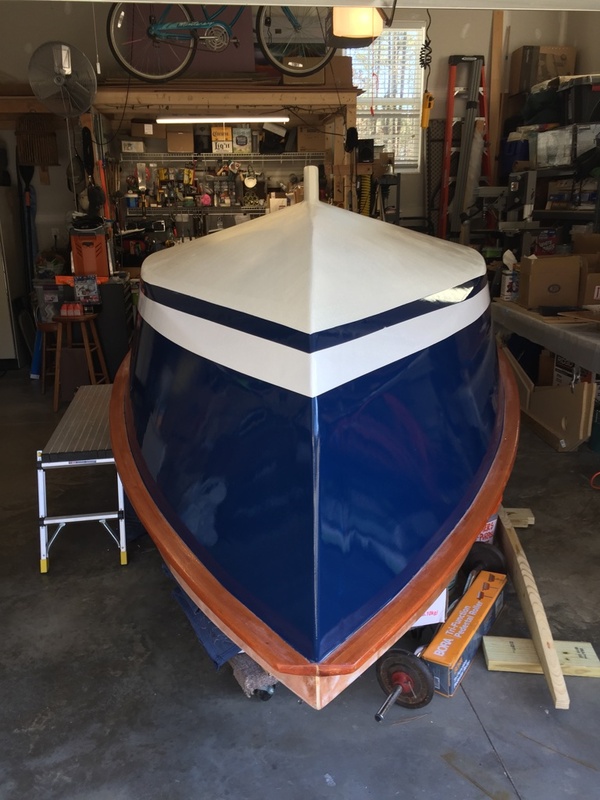 Not a lot of boat building. Been under the weather and my wife broke her wrist, so life has been a little busy with Dr. appointments. I did manage to spend a little time working on things. I glued up the strips of wood and used about every clamp I had to clamp things together. 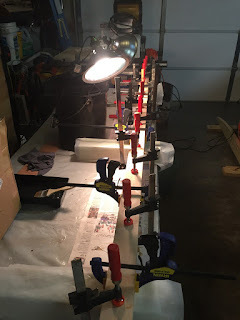 Since it was still cold in the garage, I used work lights for about 36 hours to make sure the epoxy cured. Below are a couple of pictures. I mixed up two large batches of epoxy and coated both sides of the wood on each strip with a cut short chip brush. There was a lot of squirt out, but I wanted to make sure I had things glued properly. Today I unclamped everything and used my electric hand planer to do a rough clean-up of the finished product. I think it turned out pretty good. Below is the boom gallow before any clean up. Below are the pictures of the boom gallow after I ran the electric hand planer over both sides. I really like my new Dewalt hand planer. It works very good! Next up I plan on running the boom gallow through my planer to get it down to the final thickness. I think it is 1 1/2 " . 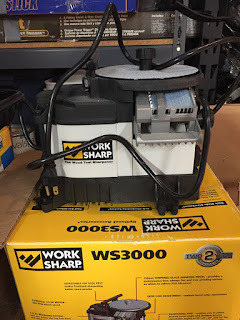 I have yet to use it and just this last week bought the Dewalt planer stand for my Rigid planer. It took me a good 2 hours to put that together today and bolt the planer to it. This way I can move it out in the drive way where I can make a big mess! Next up is to glue the tiller and work on planing things as well as start working on the mast. 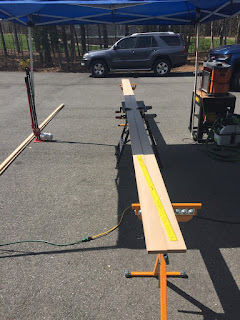 Bowsprit, Boom and Boom Gallows work! The weather was nice yesterday, so I had a chance to do some work outside. With the boat in the garage, I need to work outside with the table saw and some other big tools. I pulled things out in the morning and started to finish up some of the spars. 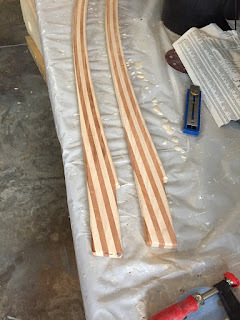 I had already cut the rough tapers, but the cuts needed to be cleaned up. I am still learning how to use a hand plane, but honestly not very good at using it. I decided to use my belt sander which did the job! I had 80 grit sand paper on it, so it cleaned up the saw markings from cutting the tapers on the table saw. After using the belt sander, I needed to do the chamfer's on the edges. I marked lines from the plans to use my router. 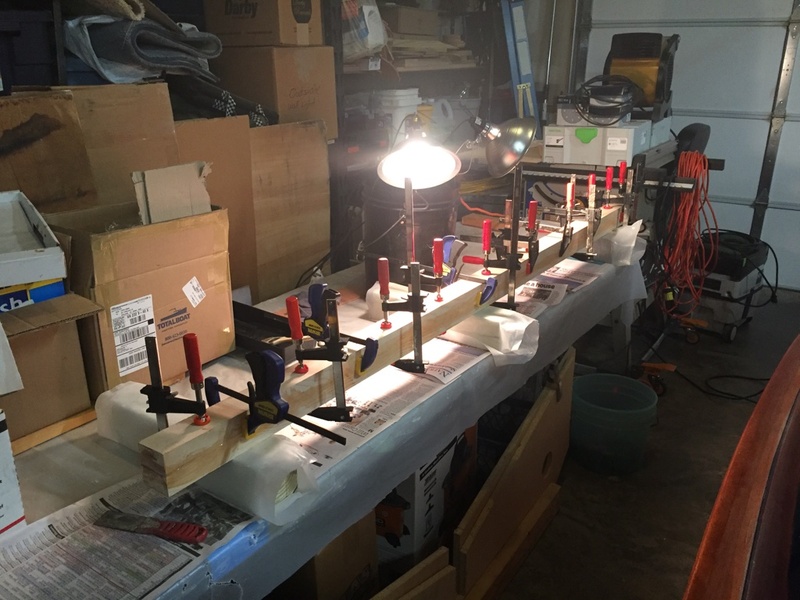 The chamfer bit I had is too large for my small router, so I had to take the larger router I have mounted in a table out of the table to use by hand. That took a little while, since I keep in the shed. 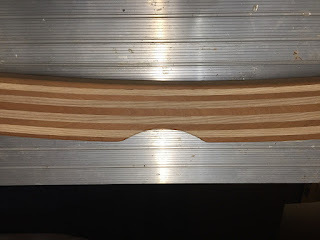 Below are few pictures of the chamfer cuts. I still need to finish sand the bowsprit, but moved on to other things I needed to do outside. I can finish sand in the garage one day. Next up was the boom to cleanup. I bought a new electric hand planer and used a piece of scrap wood practice on a little. On the lowest depth cut, I decided to move ahead with cleaning up the boom. Specifically where I had to glue the pieces together. Not a good feeling using a power planer on a piece of expensive wood, but everything turned out ok. I ran it on each side for 1 or 2 runs and cleaned up things quickly. 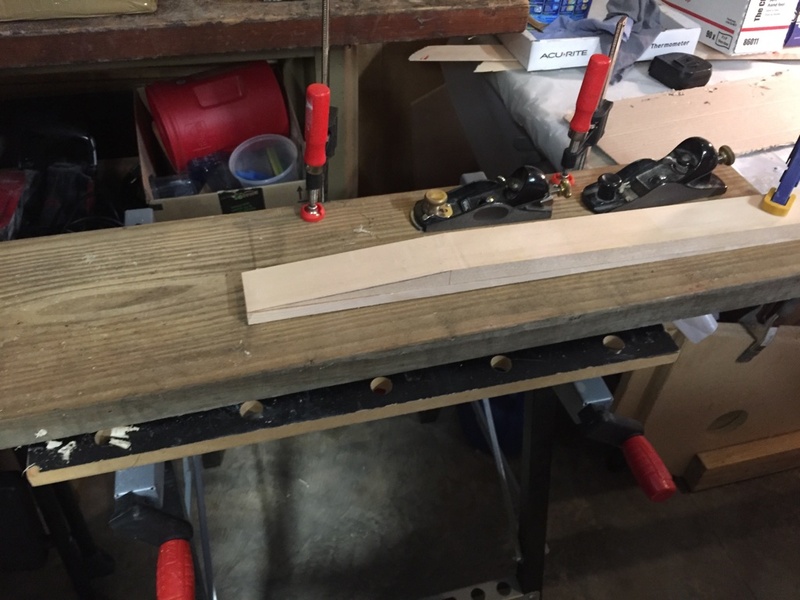 The plan calls for a small taper 15 inches from the end. I used the electric planer to do that quickly. Turned out pretty good. Below is a picture of that end of the boom. I am planning on putting a boom gallow on my boat and recently purchased some Ash and Mahogony wood to make it and the tiller. 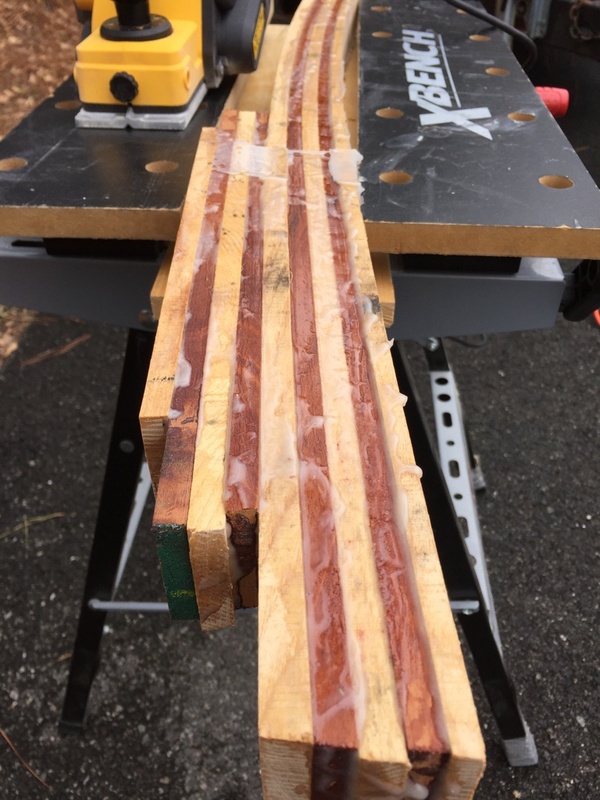 Since I had the table saw outside and I decided to cut all the strips. This was all my table saw good do to cut the wood! I will need to buy another blade. 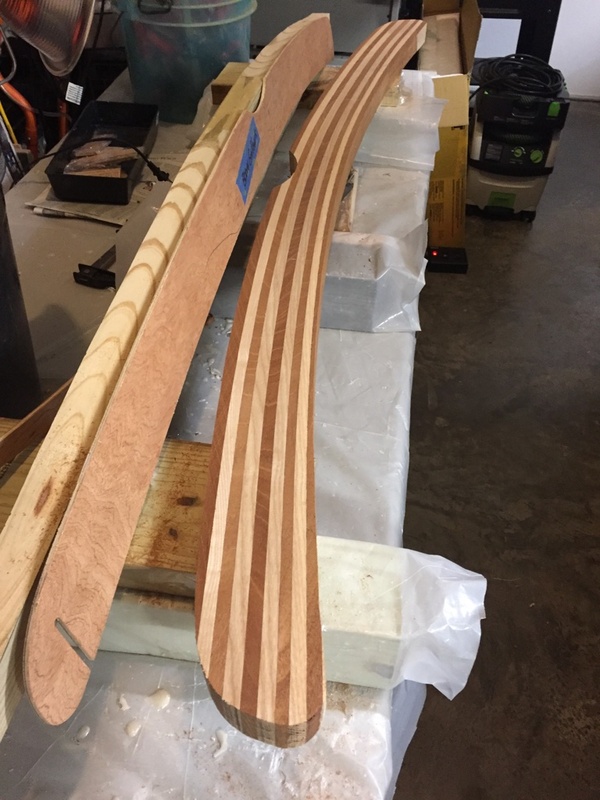 Below are the strips ready to be glued up. 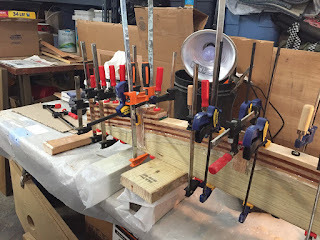 I had created a jig a few weeks ago to use to glue things together. Below is a picture of the jig with the strips doing a dry test run. I will need to wait for some warmer temperatures to glue things together. I can tell the gallow will look good! I like the mix of light and dark wood. It is a nice 22 degrees for the high today! 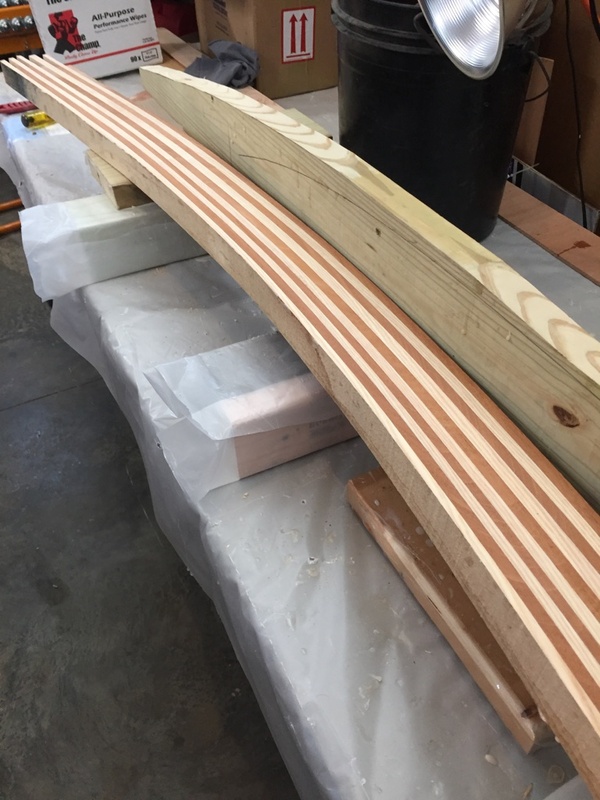 I have been working on the spars over the last couple of weeks/weekends. 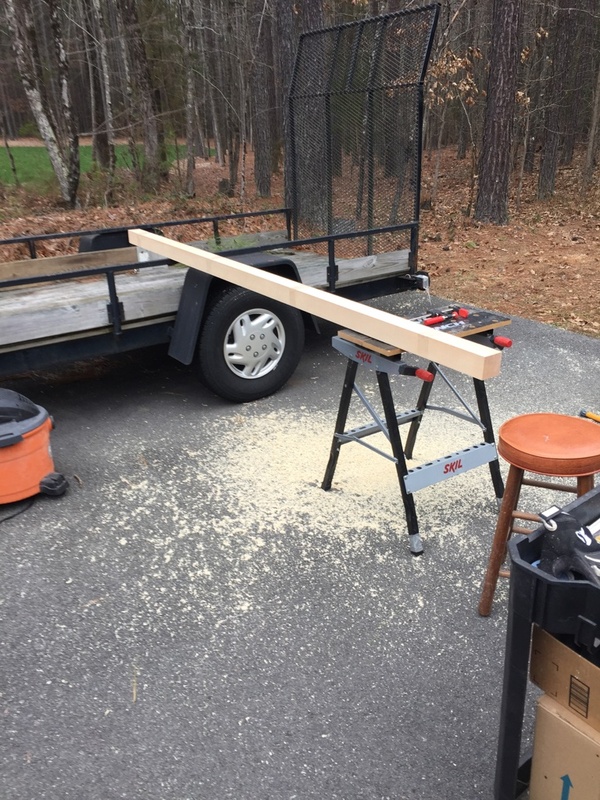 I don't have enough room in the garage to use the table saw, so I had to wait for good weather. Last weekend, I setup things outside and cut the bowsprit and gaff. The manual states that it would be safer to do it on a bandsaw, but I decided to do it on my table saw. I need to get a new blade, because it was all the saw could do to make the cuts. I took it slow and managed to get things cut. Except for the motor having a hard time, I didn’t think it was that difficult. Next up was the gaff. I used the template and marked it out and used a circular saw to cut things out. The manual then calls for a 1/2 round over on the all edges. I used my router and made the round-over. 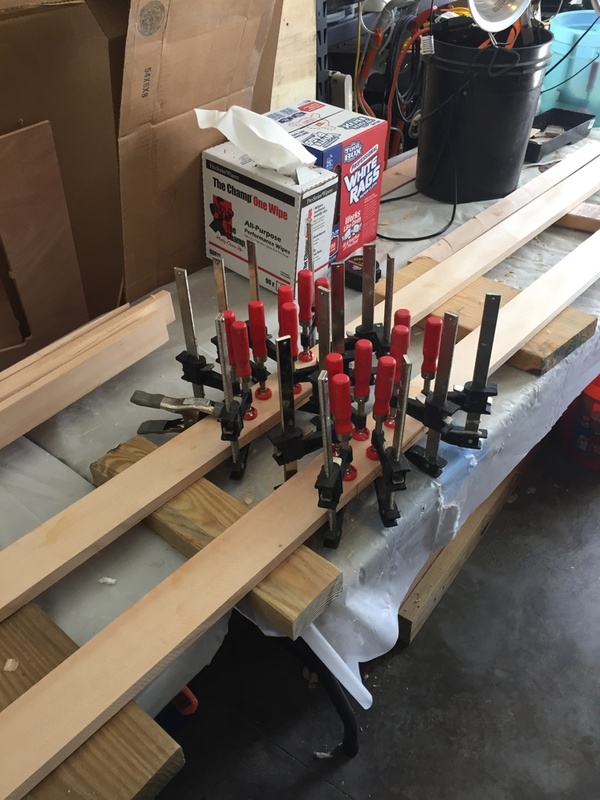 After I was finished and put away everything, I realized I used a 3/8. oops. Will need to redo, but it won't take long. Next up is the boom. 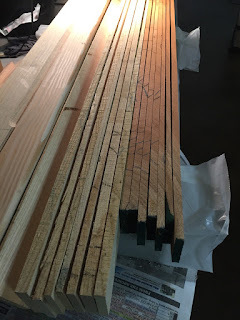 Below are a few pictures of the different pieces I needed to glue together to get the required length. They are presently curing. I have some cleanup I need to do on all of the spars I have done so far. I need to get my electric hand planer out, but the weather was not cooperating with snow this weekend. Will need to wait for better weather. 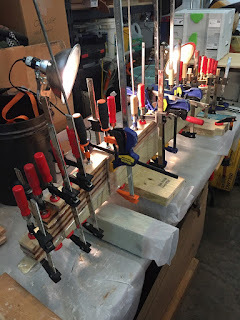 I also need to try my planer on some scrap wood before I work on my expensive spare pieces. I have yet to use the Dewalt planer I bought for this job. 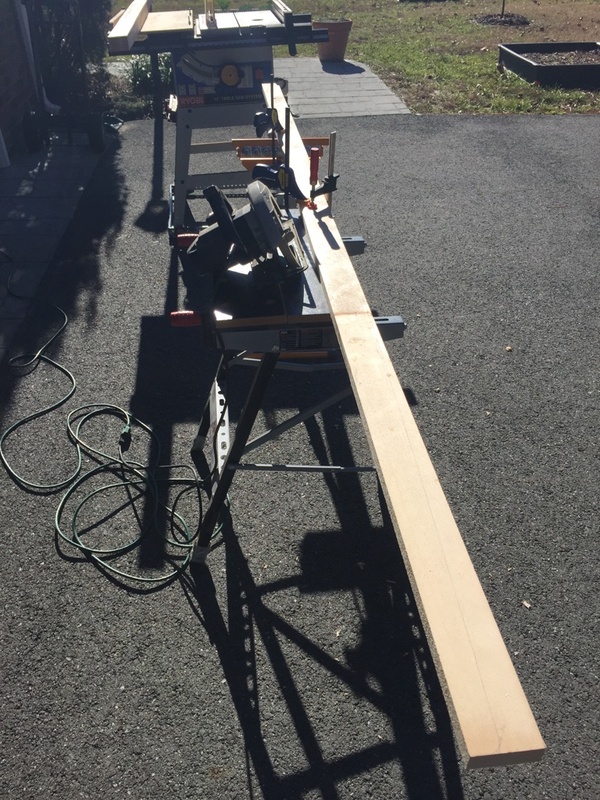 I also managed to get some wood from a local supplier for the boom gallows and my rudder. I will be cutting them into strips and epoxying them together. With the 2" thick pieces, I want to get a new blade on my table saw before I cut the pieces. Well. work is trying to work me to death. Lots of late nights till 2:00 am. troubleshooting things. I should be used to it working in IT all these years, but the older I get, the more it effects me. But in between all this work, I try to fit an hour or so in. Helps me keep my sanity! Happy New Year to everyone! One session, I finished up the 2nd coat of the boot stripe. I think it turned out pretty well. My painting skills are still so so, but for my first time rolling and tipping paint job, it looks ok. 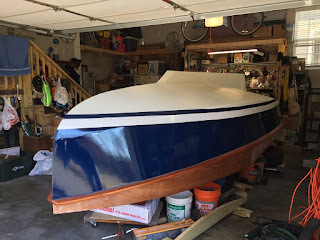 I still have some areas on the hull I want to put another coat on, but I will wait until I flip it back over to put on another touch up coat on the dark blue. I am sure I will have some nicks with flipping it. I am using the Interlux Brightside paint. Most of my painting has been in the upper 50's low 60's. The This is within specs, but it does take about 4 hours plus to dry to the touch. Below are a few pictures. 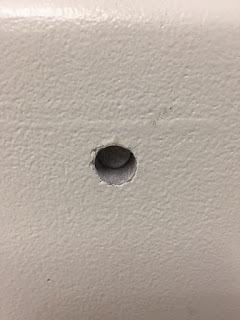 One thing I am glad I did was to drill fill and then drill out the final hole prior to doing any painting. I can't imagine trying to find the center without being able to see the hole. I have enough problems with doing it in the first place. I have had to refill a couple times, because I missed the center. Not sure there is a good trick to this. My solution was to start with a smaller drill bit and gradually work my way out to the final diameter. Once I get close I use a round file to get it as close as possible to still have epoxy and not any wood showing. Below is the center board hole with the stainless steel rod doing a dry fit. Below is a picture of the rope installed to raise the center board. You can see the filled/drilled out hole. I also drilled/filled/drilled the hole that comes in from the top. Below is a picture of the epoxy curing. I found a good use of using my camera tripod to get any height I needed. 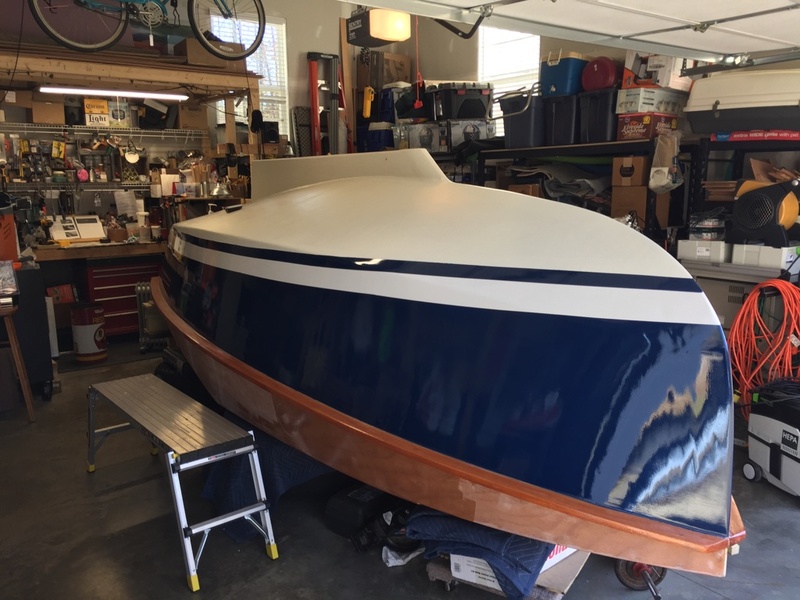 Installing the centerboard was easier than I thought. I first taped the piece of line to the permanent line to pull it through. I then wrapped a piece of cloth to a hand clamp and clamped it to the centerboard trunk. This would allow me to rest the centerboard on it to installed the rod. The rod slipped right in with a tap and I then applied thickened epoxy to both sides. Below is a picture of the epoxy curing. Next up I decided to epoxy the two pieces of wood together to make a 2" X 3" piece for the bowsprit. Below is it all clamped up and using work lights to help it cure. Work lights helping the epoxy cure. The garage is still in the 50 + degree, so additional heat is still needed. Still moving along. 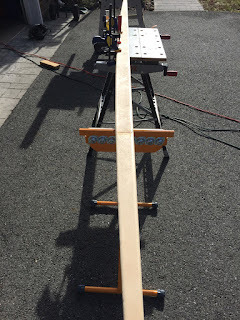 I plan on working on the spars over the coming weeks and still need to build my tiller and gallows pole. I need to purchase some lumber and will probably do after work one day next week.